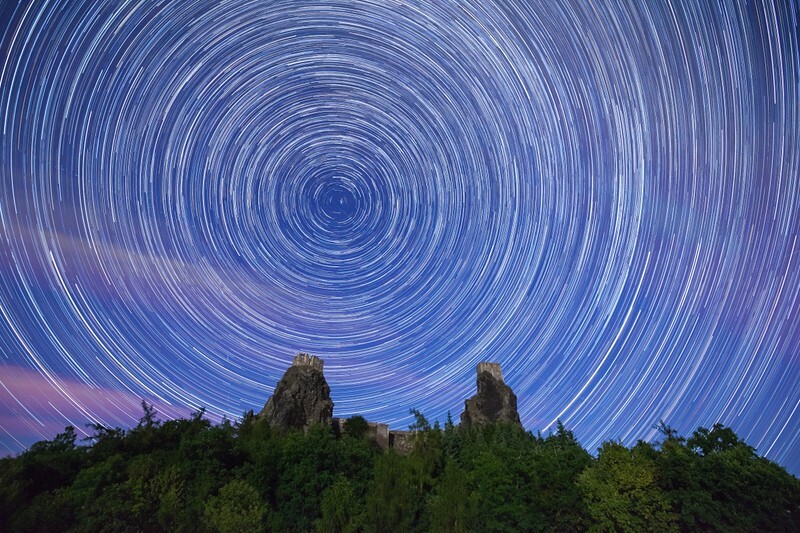 Have you ever wondered what is the ideal time for capturing star trails. What is the longest time you have ever waited for ? As I was on the "hunt" for Perseid Meteor Shower, I left the camera going as long as possible, in a hope that I would capture as many "falling stars" or rather giant burning meteors as possible. 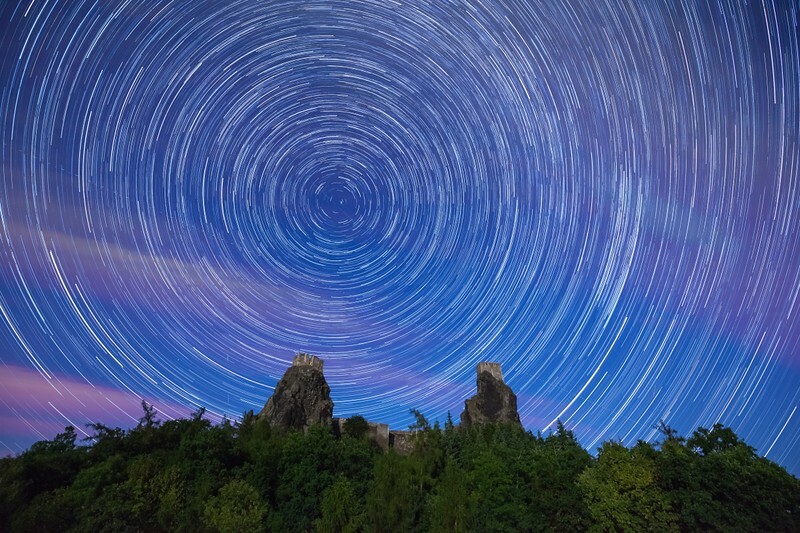 I picked the iconic landmark of Bohemian Paradise - the ruins of Trosky castle built on two volcanic rocks. Unfortunately those 2 peak nights were overcast, so I had to settle for the next night where activity was not as strong. As you can see from the result, the camera was facing North, which was ideal for the meteor shower as well as for full "Star circle" with Polar star in the middle, which as the only star always stays in a constant position towards Earth, with all other stars appearing to circle around it from our point of view. The general advice photographers give for a good star-trail photo, is to let camera capture the sky for at least 40 mins. - Capture continuously 30 sec frames for 40 mins and then use software to merge all photos together. Of course the longer you leave the camera running, the more prominent the star circles will be. My first ever star-trail attempt was the single exposure. Unfortunately the camera needed nearly as much time to process the single 40 mins shot as long as it was capturing it. Therefore ever since that experience I started with the second option. Great thing about it is that you can also use that footage for time-lapse sequence after that. I wanted to share with you different results of star-trails circles depending on the amount of frames taken plus the final time-lapse sequence put together from those photos. 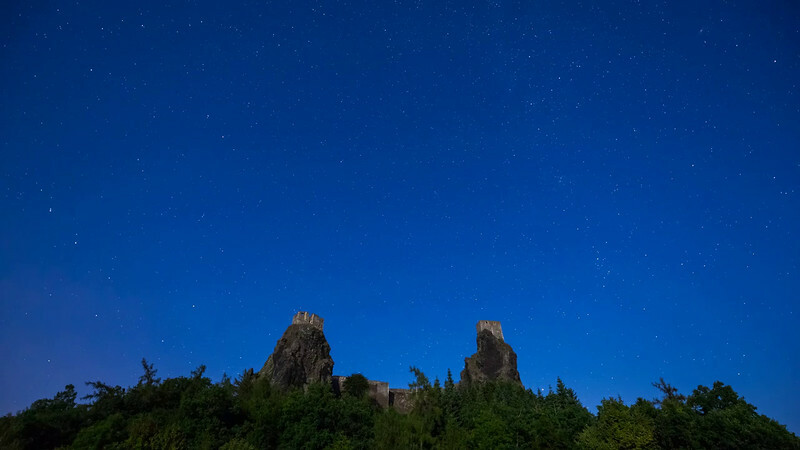 This sequence started when Moon was still up in the sky, giving enough light and keeping the sky dark blue, till the Moon disappeared completely, no longer providing light on the castle and creating darker sky with more visible stars.